Bright medium garnet color. Bright, toasty, oaky aromas of spiced black cherries, dried leaves, planked oak, and red flowers - dried canvas with an lively, dry full body and a warming, appealing, relaxed finish with earthy, leafy tannins and moderate oak flavor. 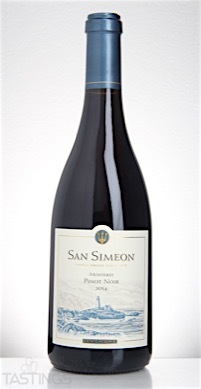 San Simeon 2014 Pinot Noir, Monterey rating was calculated by tastings.com to be 91 points out of 100 on 5/10/2016. Please note that MSRP may have changed since the date of our review.